Steelway Cellar Doors fabricates made-to-order galvannealed steel window well covers that will boost your basement's energy-efficiency, keep out debris, and prevent leaking. By working closely with contractors, builders, architects, and homeowners, we build window well covers and window well replacement products that are certain to enhance the appearance of any home or property. Our basement window wells and window well covers feature classic styling and are sturdy, long-lasting, and made to fit! Choose from different styles such as curved window well covers or square window well covers that are perfect for masonry or wood areaways. 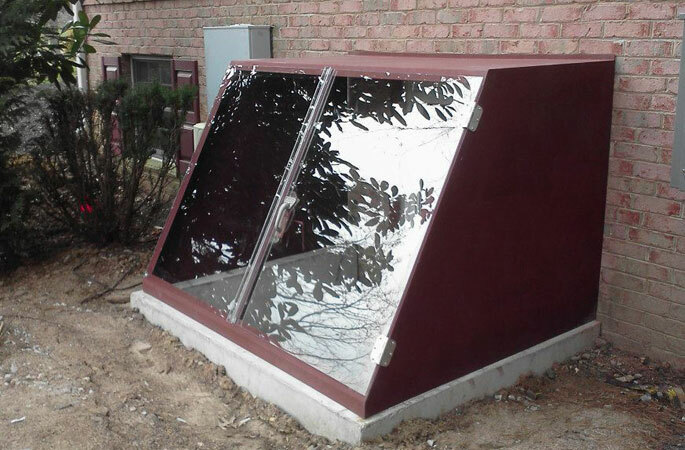 Get a window well and a cover in one with our window well and cover combo unit! Get a FREE Window Well & Cover Installation Quote Today! "The entire process was easy and everyone was so nice and..."
"John and Andrew did an outstanding job. They were both..."
Our uniquely designed window well covers offer numerous benefits in Delaware, Montgomery & New Castle Counties! A curved, rectangular, or standard steel window cover will protect your basement windows from water and debris. They fit. We make sure that each cover fits your unique opening or situation. They look good. We work with you to design the best look for your property. The lenses are replaceable. If the lenses are ever damaged you only need to replace the lens, not the entire cover. This saves you money and time. They last. We use 12 gauge galvannealed steel, welded construction, and three coats of primer to ensure superior corrosion protection and strength. They are clearer. We use UV and scratch resistant, replaceable, Lexan lenses for a cleaner, clearer look. They are easy. We design the units for easy window well cover installation and maintenance. They stay put. Our covers won't blow away or get knocked off. They are strong. Don't worry if a load of snow drops off the roof! These steel reinforced window well covers can handle it. They are reasonable. Call or contact us online for a window well replacement quote. They are more reasonable than you would expect! All of our basement window well covers are built with the highest quality materials and the highest level of craftsmanship. Our covers are made from 12 gauge hot rolled galvannealed steel with a Premium Lexan or safety glass lens that is durable, maintains light, and has the ability to be replaced. The seams are welded to keep out rain while providing the greatest strength. The window well covers are dipped in red metal oxide primer to ensure complete coverage prior to shipment, and this primer allows you to paint them the desired color that will accent or blend with the existing exterior of your home. The replaceable lenses are UV protected polycarbonate that will never haze or crack and, most importantly, our basement window well covers are custom made to fit any size application! Steelway Cellar Doors' window well covers were created as a more permanent and substantial solution to the cheap or overpriced options that are currently on the market. Not only will our window well installations and window well covers enhance the look of any home, they will also keep out debris and allow in the light! When you invest in window well covers from Steelway Cellar Doors, they will protect your basement opening for the next 10, 20, even 30 years with minimal, basic maintenance. There are no substitutes on the market at this quality and at such a value price! Whether you need window well covers for your current window wells, window well replacement for your leaky basement windows or a brand new window well installation, Steelway Cellar Doors has the answers. We proudly serve Norristown, King of Prussia, Wayne, Philadelphia, West Chester, Abington, Wilmington, Cheltenham, Havertown, Haverford, and throughout the surrounding areas. Contact us today to find out more about our basement window well installation services! Get a FREE Window Well & Cover Installation Quote Now!